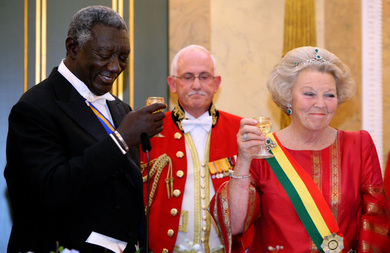 Of course, the Dutch did not only Ghana's coast for its gold and tropical produce - trade quickly desintegrated into slave trade, but according to Ghana's President John Kufuor that is not what his country holds against the Dutch these days. 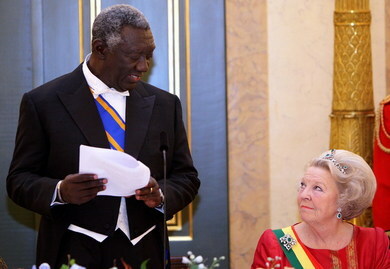 There are centuries old common bonds, and he came to The Netherlands on his first and last - Kufuor leaves office in January 2009 - State Visit to strengthen these bonds. "I have received many invitations, but this was one I could not turn down", he told Queen Beatrix at a government luncheon at the majestic Trêves Hall, normally the meeting room of the Dutch government. At the state banquet Tuesday evening at Noordeinde Palace, he elaborated on the good relations between the two countries, urging the Dutch to invest more and to join forces with Ghana. Queen Beatrix in her toast to her Ghanese guests said the Netherlands looks back at its role in de "inhumane" slavetrade "with horror". She praised the contribution of the Ghanese diaspora in Holland to the Dutch fabric. Kufuor in turn hailed Royal Dutch Airlines KLM for never having lost faith in Ghana, by always keeping its route to Accra open. ,,The most dependable airline and country", Kufuor said of the Netherlands and KLM.